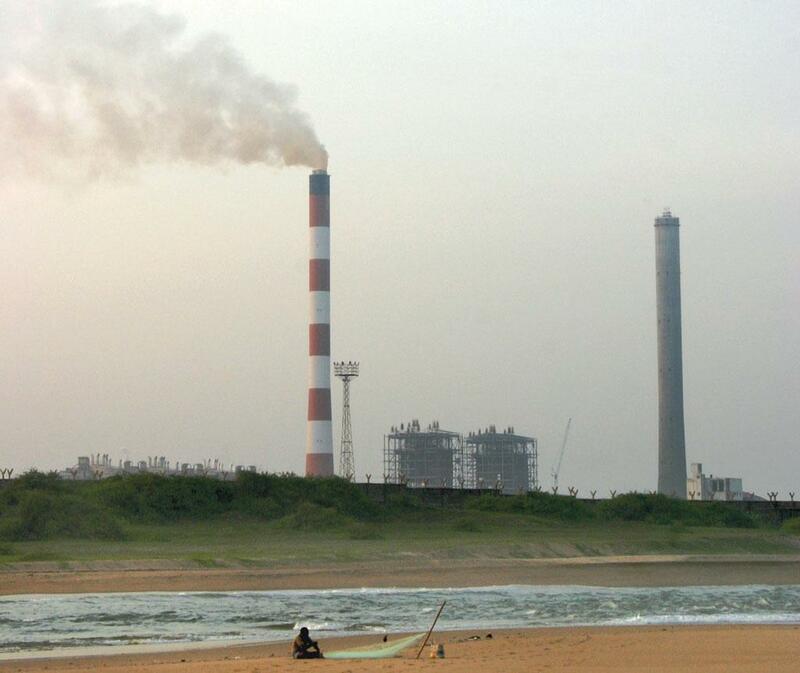 India's thermal power sector is extremely polluting. Of all the emissions from the industrial sector in the country, coal-based power plants account for 60 per cent of particulate matter, 45 per cent of sulphur dioxide, 30 per cent of oxides of nitrogen and 80 per cent of mercury. There are several reasons for this: dated technology, poor operating practices, inadequate investments in renovation and low quality of Indian coal. One of the important reasons is the old age of India’s power plants, which tends to lower their efficiency and worsen their emissions. A number of old plants use once-through-cooling (OTC) systems that consume a large amount of water. The total capacity of India’s thermal power plants (owned by the Union government, states and private players) is 185 GW, of which 34.3 GW comes from plants older than 25 years. This is the commonly considered useful life cycle of a thermal power plant (see ‘Done and dusted’). To deal with the problem, the government on December 7, 2015, announced stricter pollution and water-use standards. As per these, the newer plants will be held to higher standards while the older ones have to comply with relatively lax standards. However, upgrading older plants to meet even these lax standards may not be technologically and economically feasible, a fact acknowledged by power minister Piyush Goyal in an international conference on coal held in Delhi this March. Heat on Power, a report released by Delhi-based non-profit Centre for Science and Environment in 2015, recommended that the old capacity should be expeditiously decommissioned. Goyal has also said that coal-based plants that have passed their useful life should be shut. Frequent breakdowns, poor efficiency and excessive pollution were the main reasons cited in the recommendation to replace the old plants with new supercritical plants that are efficient and have a lower environmental impact. In August 2015, the Ministry of Power asked the Central Electricity Authority (CEA) to prepare a report on retirement, renovation or replacement of 34.3 GW of old capacity with supercritical units. But the report failed to come up with clear conclusions or ambitious goals. It said that of the 32.8 GW owned by the Union and state governments (the remaining 1.45 GW of the capacity is privately owned), only 5.8 GW can be retired. The report suggested that this too can be replaced with 10 GW of new capacity. Moreover, the report recommended that plants totalling around 22 GW of capacity can be operated for a “number of additional years” since some of them have already undergone renovation and modernisation (R&M) or life extension while others are planning to do so. However, the recommendation to allow a significant number of plants to extend their lives in the hope of improvement in performance is impractical. India’s experience with R&M projects has been unsatisfactory. In the 11th Five Year Plan (2007-12), the power sector managed to complete life extension of only 26 per cent of what it had planned. In the 12th Five Year Plan (2012-17), just 18 per cent of the target was achieved till March 31, 2016. Several projects that were executed took significantly longer than planned and the improvement in performance was inadequate. There are numerous reasons for this. There are considerable risks in R&M project, especially when inadequate maintenance investments have been made in the past, which is typically the case with state utilities. Also, companies do not have sufficient technical skills and management wherewithal to oversee the projects. Government utilities are uncomfortable entering into contracts because of uncertain risks. These factors have made contractors wary of taking these projects, affecting market capacity to execute projects. While the old plants continue to run, the newer plants, which are more efficient, remain underutilised. India’s coal-based power capacity increased from 71 GW in March 2007 to approximately 185 GW in March 2016. With the increase in power capacity outpacing the growth in demand, the overall capacity utlisation, or plant load factor (PLF), declined from a peak of 78.6 per cent in 2007-08 to around 62 per cent in the first quarter of 2016. 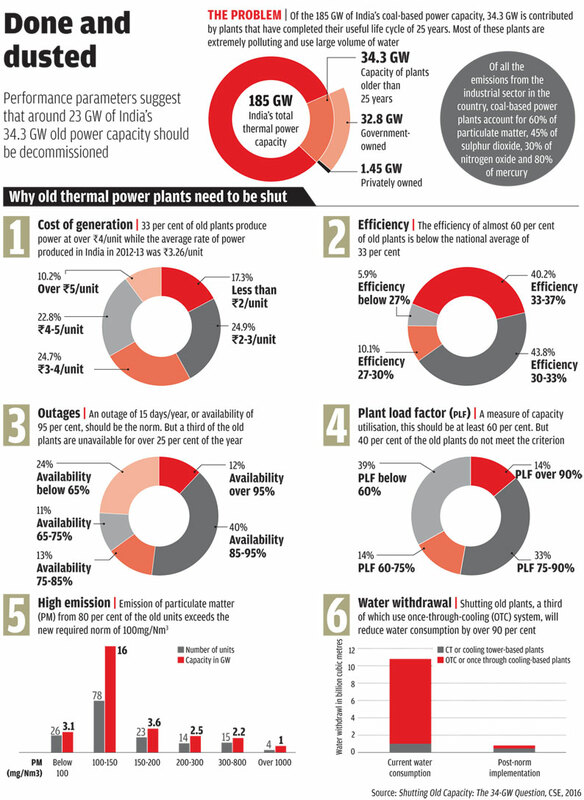 Industry experts suggest PLF should be around 65 per cent for a plant to be viable. The situation is far worse for the newly commissioned plants. Around 90 GW of capacity commissioned between 2009 and 2015 had a PLF of just 47 per cent during 2015-16. Ratings firm CRISIL estimates that approximately 36 GW of plants that were commissioned after March 2009 are financially stressed. One practical solution to deal with this problem could be to reduce the generation from old, inefficient and polluting plants, and enable the clean and efficient plants to operate at optimum levels. This will also help strengthen the power generating companies, a large number of which are financially strained. The power companies can invest in future capacity, needed by the country to meet its growing power needs, only if existing projects are viable. The CSE study suggests that around 23 GW of India’s 34.3 GW old capacity should be shut immediately. India’s excess power capacity (in relation to demand from the discoms) gives us breathing room to shut old plants while new ones are being commissioned. However, most of the plants that need to be shut are owned by state governments and closing them could become a political issue. To overcome this, the Centre can incentivise states by providing them additional share of inexpensive power from the central pool. Another option is to offer them subsidised loans/equity to build new capacity. As per CEA recommendations, setting up a 10,000 MW replacement capacity would require Rs 15,000 crore of equity (assuming total cost of Rs 50,000 crore and equity of 30 per cent) spread over five years. This could be easily financed with coal cess. The Centre could also eliminate the requirement of environmental clearance or consent to establish for setting up a new plant that replaces old unit. The consent to operate, granted by state pollution control boards, should suffice. 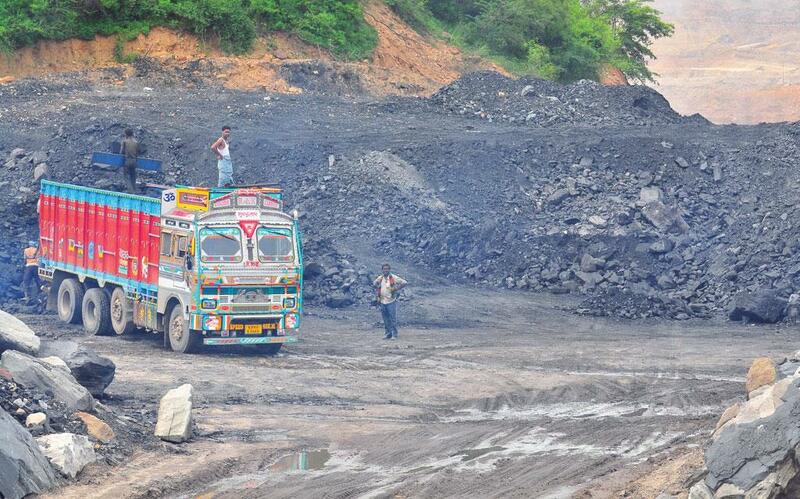 Easy transfer of coal linkages from old plants to new ones must also be facilitated.